The EasyDaysies Magnetic Schedule was created by a Mom of three and she’s got scheduling down pat! The simple board helps structure kids’ daily routies while teaching them independence, self-discipline and sight word recognition. With the “To Do” and “Done” columns, you can also use it as a reward system. This starter kit comes with the board and 18 Magnets that cover everyday activities such as get dressed, do homework, and bath time. This week, we’re also offering a 15% discount on the supplemental kit for Family Activities. This pack includes 9 magnets to add to your schedule that families often do together such as shopping, movie night, church and more. 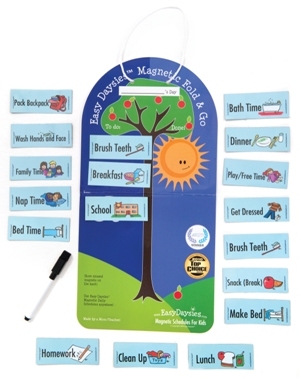 This week only, save 15% on both the EasyDaysies Magnetic Schedule for Kids and the Family Activities Kit by entering the Promo Code BLOGEDMS at checkout. *Offer expires on April 24, 2012 at 11:59 pm EST. Not compatible with any other offer. Be sure there are no spaces after the Promo Code when you enter it at checkout. Written by: Different Roads to Learning on April 17, 2012. This entry was posted in autism, autistic spectrum disorder, Pick of the Week, Products, Sale, Transitions and tagged ABA, ADL's (activities of daily living), behavior management, daily routines, schedules, transitions, visual supports by Different Roads to Learning. Bookmark the permalink.